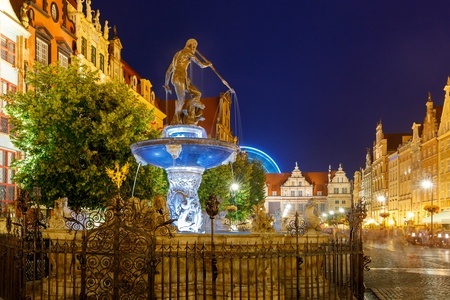 Statue of Neptune in the Long Market (Długi Targ) in Gdańsk’s Old Town at night. The building in the background is the Green Gate (Brama Zielona), built in the late 16th century as the formal residence of the Kings of Poland. Gdańsk has had an eventful history, changing hands many times. The first written evidence of its existence dates from the year 997. It spent its first 300 years as part of the Polish Duchy of Pomerania, but then fell briefly under the control of Brandenburg before being taken over by the Teutonic Knights on behalf of the Polish king. The Knights promptly carried out a massacre of the local inhabitants, took control of the town on their own behalf and colonised it with German settlers, who called it Danzig. In 1457 it became Polish again after a 13-year war of independence, but retained a good deal of local autonomy. When Poland was divided between Prussia, Austria and Russia in 1793, Gdańsk was allotted to Prussia. It became a Free City under Napoleon between 1807 and 1814, but then reverted to Prussian rule. After Germany’s defeat in the First World War and the resurrection of an independent Poland, Danzig and its majority-German population became a Free City again under a League of Nations mandate, with Poland becoming responsible for its foreign relations and much of its infrastructure. The Nazis won control of the local government in 1933, and Danzig was absorbed into Germany shortly after the outbreak of the Second World War in 1939. After the War Gdańsk became part of Poland once more and its German inhabitants were expelled. It had another spell at the centre of world events in 1980, when Solidarity (Solidarność) was established at the city’s Lenin Shipyards as the first independent trade union in a Soviet bloc country. This entry was posted	on Friday 18 December 2015 at 16:37	and is filed under 2015, Poland. You can follow any responses to this entry through the RSS 2.0 feed. You can leave a response, or trackback from your own site.